America’s first capital of cigars was Tampa, Florida. This is what happens when a visitor attempts to smoke as many stogies as possible every day. There is one place left where smoking makes sense, where it’s part of a cultural heritage, a testament to craftsmanship, style, and family. A place where a good cigar is a tradition. That place is in Tampa, Florida. It could be called the Cigar Capital. Its real name is…Ybor City. It’s mid-morning and I’m smoking a strong, fat cigar on an empty stomach. Not the healthiest breakfast, but when you’re sitting in a cigar cafe in Ybor City, and everyone else around you is smoking cigars, it makes perfect sense to do so. This historic Latin Quarter district of Tampa, Florida was once the Cigar Capital of the World. In the early 20th century, 20,000 workers were employed here, producing up to 700 million cigars a year, all handmade from Cuban tobacco. Don Marco remembers the last heyday of Ybor City’s cigars. He grew up here, and owns the King Corona Café & Bar, where we’re sitting at the moment. Speaking of tobacco in the air, Don is halfway into a Puro Placer, a Lonsdale-sized cigar from Nicaragua. I’m working my way through a Cuesta-Rey sun-grown Robusto. Cuestas are now made in the Dominican Republic, but were once produced here, along with Arturo Fuentes, Romeo y Julietas, and dozens of other brands. One of the cool things about Ybor is that if you already smoke cigars, it’s like making a pilgrimage back to the source. This is the Mother Lode. Ybor is still headquarters for many companies and distributors. Cigars cost up to 50 percent less than anywhere else. And it’s so acceptable. I live in California, where you have about five minutes to enjoy tobacco before an angry mob materializes and disembowels you right there on the sidewalk. I make a vow. While in the Cigar Capital of the World, I will sample as many cigars as possible. Even if it makes me turn green, I will transform myself into the ultimate cigar tourist. It isn’t difficult to do. Evidence of the cigar ancestry is everwhere. The sidewalks are emblazoned with large tobacco leaves outlined in stone. Shops display rollers in their windows, usually an elderly Cuban man, puffing away as he works. A blues band guitarist wears a Fuente baseball cap. A local brewery posts a giant vintage “Hav-A-Tampa” sign. Everyone is smoking cigars — men and women, retirees and teenagers, tourists and locals. It’s like we’re all in a gangster movie. Marco has always been around the cigar business. He lived across the street from a cigar factory. His wife’s great-grandfather came to Ybor from Cuba and worked as a cigar roller. For several years Marco ran the Tampa Rico cigar company, which included a factory and chain of retail stores. In 1998 he scaled back operations and opened the King Corona shop on Ybor’s main strip, 7th Avenue, or what locals still call Broadway. King Corona sells cigars, clothing, food, alcohol and coffee, and in the rear of the store, a barbershop does a good business. He no longer makes cigars because it’s too expensive to hire a roller, he says. That sort of thing is really just for the tourists. Also, most of the rollers working in the shop windows produce only mild strength cigars, because the darker, stronger wrapper leaves are more difficult to control. Tourists don’t care, but true cigar people notice the difference. Few cigars are still made in Ybor. The small chinchales, and across town, the J.C. Newman family factory still cranks out machine-made Rigolettos. Most cigar manufacturing has left Florida, moved to Caribbean countries where the Cuban seeds have been successfully replanted. Cuba has lost the edge in agricultural techniques, Marco says. The best professional rollers have all emigrated to Honduras, Nicaragua, and the Dominican Republic. These cigars are now, in Marco’s opinion, better than Cubans. After a quick lunch, followed by a Sancho Panza Caballero, a medium-bodied Honduran, Manny Leto meets me at the Ybor City Museum. Manny acts as local historian of the Ybor cigar industry. He grew up in Tampa, and has taken it upon himself, at the ripe age of 29, to digest what has happened to Ybor in the last 100 years. We walk through the museum’s permanent exhibit, and he explains the origins of the former Cigar Capital of the World. In the late 19th century, a Cuban cigarmaker named Vincente Martinez Ybor sensed an opportunity to make cigars in Florida. The timing was right. Cuban was in the midst of a civil war with Spain, and labor issues were difficult. Ybor scouted around Florida, and settled on a sparsely populated swamp outside Tampa. Buildings were erected and streets laid out. The first two tabaquerias opened in 1886 by Ybor and Ignacio Haya, and attracted a diverse labor pool of immigrants from Cuba, Spain, and Italy. Ybor was structured as a company town, with the tabaqueros living in wooden casitas within a few blocks of the factories. Mutual aid societies were set up for each immigrant group, providing medical care, and promoting cultural entertainment. People were born, lived, worked and died within the same 40 acres. By 1919, workers were producing more Cuban tobacco cigars than Cuba itself. Ybor cigars were known as the best in the country. Other cigar companies would brazenly print “Tampa” on their labels, even though they weren’t associated with Tampa at all. The name meant quality. Manufacturers recognized the power of advertising early on. Because shops displayed cigars with open boxes, label artwork needed to attract the eye. Lithographers from Germany helped create the technique to print box labels and cigar bands, some so intricate it took 30 printing registers just to reproduce one label. This information is all very exciting, and could really be enhanced by enjoying a nice cigar. I’ve got a Honduran Reo Robusto in my pocket, recommended by Don Marco. The five-year-old Sumatra seed wrapper leaf from Costa Rica, wrapped around a blend of Nicaraguan and Honduran filler. It’s been 20 minutes without tobacco in my mouth. But Manny doesn’t smoke. And also there’s no smoking in the museum. Manny shows me a wall-sized photo of a factory rolling floor. In the image, hundreds of men and women are sitting at tables, talking, smiling, rolling cigars. It’s a very integrated group: young, old, black, white, Cuban, Spanish. Workers learned their craft through apprentice work, usually starting off rolling cigars in small “buckeye” shops, so nicknamed because, it’s thought, the inferior tobacco was from Ohio. In a corner of the photo, a man stands on a raised platform, talking and gesticulating. This man is a lectore, or reader. A lectore was a human CNN of the era, delivering the day’s news and narrating classic novels by Cervantes, Zola, Victor Hugo and Jules Verne. Originating in the Caribbean, lectores were brought to Ybor by cigar company owners, who wanted something to keep the workers occupied, rather than gossiping and complaining about the management. Workers loved the idea, and paid for lectores out of their own pockets, even holding auditions to choose the best quality performer. The best lectores could translate between languages on the fly, and when reading a novel would even act out the various characters in the story. Their status ascended to become the factory’s highest paid worker. But hearing all that news educated the workers with an increased socialist and union awareness. Ybor factory owners removed the lectore stands in 1931, says Manny, and in retaliation, everyone went on strike. Although eclipsed by the perpetual noise of mechanized factories, lectores still exist today to some extent. Cigar rollers often listen to a Spanish language radio station while they work. In 2003, Cuban-American playwright Nilo Cruz won a Pulitzer for “Anna in the Tropics,” about a lectore in a 1929 Ybor cigar factory, played by Jimmy Smits. Ybor’s cigar industry declined gradually, through the Depression and World War Two. Mechanization eliminated many jobs. Cigarettes became more popular, and convenient. And at 25 to 40 cents apiece, many Americans could no longer afford handmade Ybor cigars. Ybor also suffered from the federal government’s 1949 Housing Act, which leveled entire blocks. A new interstate highway literally cut the city in half, driving many out to the suburbs. By the 1970s, Ybor City was virtually a ghost town. Only a handful of cigar factories and shops remained, amid a growing population of artists and bohemians. Manny remembers seeing a newspaper article about one artist who lived alone in a giant cigar factory building. Sensing an opportunity to revive the city, local officials relaxed zoning restrictions to promote entertainment. Bars and nightclubs eagerly moved in, and Ybor City was now the place to come and party. Sports bars and punk pits opened up alongside posh dance clubs with velvet ropes. The 1990s cigar boom added more tobacco retailers, with freelance entrepreneurs set up along 7th Avenue, selling cigars from shopping carts and hospital gurneys. In 2001 the city opened a $45 million Central Ybor retail and entertainment complex, on the site of an abandoned cigar factory. An annual Cigar Heritage Festival now draws over 10,000 people. The museum’s gift shop sells its own brand of cigars, called Ybor City Society, rolled at the museum by master artisan Dagoberto. I light one and walk a few blocks to Ybor Square, a block-long complex of brick buildings which was once Vicente Martinez Ybor’s original cigar factory. It’s now rented out to offices and restaurants. I poke around the plazas, looking in the windows, imagining the rooms filled with workers, all smoking away, listening to Jules Verne and the local news. As the day winds down, I light another no-name brand I bought on the street, and stop by the local songwriter night at the New World Brewery, where strangely, I am the only person with a cigar. I go to bed, dreaming of green tobacco fields, the leaves rustling in the gentle Caribbean wind. Morning in Ybor brings a bit of congestion in the chest. Well, more than a bit. But hey, it’s a cigar town. I shake it off, leave the hotel and spark up one of my own, a Dominican Romeo y Julieta. After a breakfast of café con leche and Cuban sandwich at Carmine’s, it’s time to investigate the Ybor cigar scene firsthand. The El Sol shop opened in 1929, and is the oldest cigar shop still operating in Ybor. Owner Bob Saitta is the grandson of the founder. He sells mostly imported cigars, although he stocks a few sizes that are made in Tampa. He directs me to a Dominican robusto, wrapped in cellophane with the “El Sol” printed on the side. I light it up immediately. Not bad, strong and well constructed, nice after a Cuban sandwich. I stroll down 7th and notice at least three chinchales (cigar makers), all with fresh cigars in the windows. All three have opened in the last six months. I enter one named Tampa Cigar, but nobody seems to be around. The cigar rolling station sits idle. Another, Havana Dreams, features cigars that just look too mild for my rapidly disintegrating palate. 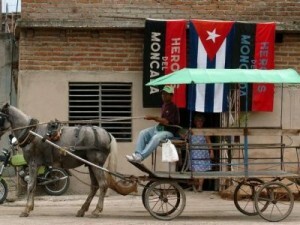 The La Herencia De Cuba shop (“The Inheritance of Cuba”) looks the most promising. A clerk tells me the store has been open only a month. An elderly man sits in the window, patiently smoking and rolling cigars. This is cigar legend Roberto Ramirez. According to the wall of news clippings, Ramirez was once in charge of over 500 workers at the Cohiba plant, and has rolled cigars for Fidel Castro and Bill Clinton. In terms of cigar street cred, it doesn’t get any better. I pick out a nice rich dark torpedo. As with all the local chinchales, Herencia sells every cigar they make. It’s fresh, moist, but a nice draw. A good follow-up to the El Sol Robusto. Again, totally unnecessary. But It’s important to keep the process going. Just down the street, the Metropolitan cigar store dates back to 1933, and is essentially a completely-enclosed walk-in humidor. Like El Sol, it also offers a few locally made cigars, but the majority of business is in major imported brands like Cohiba and Macanudo. Bill Cosby’s signed photo lingers on the wall. A few blocks away, Arturo Fuente Sr. and Jr. operate the Tampa Sweethearts cigar company, a wholesale and retail business specializing in Fuente family brands. Fuente started in 1912 and is the oldest cigar family still in Ybor. Customers can walk up to a glass window and order their cigars, much like a teller window at the bank. My next stop is the Columbia Restaurant, which last year celebrated its 100th anniversary. Founded in 1805 as a lunch spot for Ybor cigar workers, the Columbia has been called “America’s oldest cigar bar.” Over the years it’s grown into a block-long Cuban/Spanish restaurant with 15 dining rooms, and weekend flamenco shows. Richard Gonzmart, great-grandson of the founder, now runs the day-to-day operation, along with his daughters Lauren and Andrea. The original Columbia was fronted by an unpaved road, and bordered across the street by a swamp. There was no front door, it was open 24 hours, with staff making Cuban sandwiches in the window. Today the same café is still a dining room, beautifully accented with dark woods and antique light fixtures. During the 1990s cigar craze, Gonzmart decided to revive the family cigar business. He hired Cuban rollers to create a Gonzalez-Martinez brand, and opened a small chinchale inside the Columbia gift shop. With a keen eye for publicity, he positioned his daughters to sit at the Columbia’s bar and smoke cigars. “Sales spiked,” laughs Andrea. A photo of her even ended up, at age 16, in Cigar Aficionado magazine. After an excellent lunch of Spanish bean soup and Cuban sandwiches, Gonzmart and his daughters walk me through the labyrinthine building, behind a secret panel and up a flight of stairs. During Prohibition the Columbia operated two clandestine rooms on this floor, for private parties. Gonzmart is renovating them into cigar-friendly VIP dining areas, and says he’s already planned out the ventilation. Gonzmart doesn’t smoke many cigars anymore, but he does favor the occasional Diamond Crown Maximus, made by Tampa’s own J.C. Newman in the Dominican Republic. I make a note to find one of these. At the King Corona café, salesman Josh Holland says, “Oh sure, we have the Maximus.” He leads me to the humidor, which takes up an entire wall of the store, and there it is. A gold-encrusted, beautifully ornate box, and inside, perfectly rolled cigars blended from seven individual tobacco leaves, each wrapped in a special El Bajo Sun Grown leaf, grown by the Oliva family, Ybor’s “First Family of Tobacco.” A limited edition available to only select suppliers around the country. Astonishingly, they’re only $10 each. It’s not just my palate. A taxi deposits me at the Tampa airport, clothes reeking of tobacco smoke. My throat hurts. I’m dizzy, tingly, agitated. My fingers stink. My pockets are filled with cellophane wrappers and cigar bands. I want to get my blood and lungs flushed, and then curl up under a plastic chair and dream of peaceful Florida sunny afternoons, with a lectore orating the latest adventure novel. But the gate is calling my name. I start running with my luggage, gasping for air, lungs pounding. I don’t know which terminal is which. How do those old Cuban guys smoke so many cigars, every day? Every roller works with a big stogie sticking out of their mouth. I think of the musicians in the film Buena Vista Social Club, all in their 70s and 80s, all still hitting the cigars. Is it in their DNA? Maybe I’ll never make it out of Tampa. I’ll miss my flight, and end up staying here forever in the cigar womb. I’ll forward all my mail, sit at an outdoor table, and puff away life’s worries with the best cigars in the world. Generacion Y: Excellent blog from Havana, by journalist Yoani Sánchez. 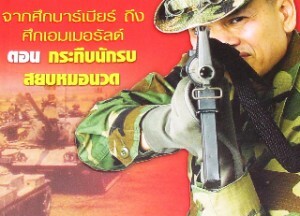 Asia Correspondent: News from Bangkok and beyond, by foreign correspondent Richard Ehrlich. 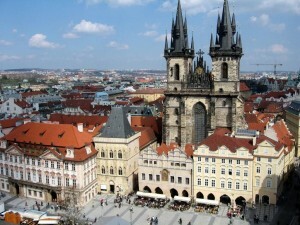 Prague Culture: Weekly guide to what's happening in Prague, from journalist Frank Kuznik. TSF JAZZ: Best radio station in Paris, hands down. 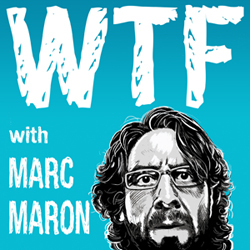 Marc Maron's WTF: My pal Marc Maron's hilarious and smart podcast, updated way too often. The Rumpus: Who you going to believe: Google or your lying eyes? Copyright Jack Boulware. All Rights Reserved.